Dutch landscape painter. Little is known of his life, but he travelled extensively in Switzerland and Italy in the 1650s and is best known for Italian scenes. On his 1655 trip to Switzerland young Hackaert, whose ideal landscapes show the influence of Jan Both, was commissioned to make a series of completely different type of landscapes. The Amsterdam lawyer and collector Laurens de Hem employed him to make exceptionally large detailed topographical drawings of spots in Switzerland, from the Rhine Falls at Schaffhausen and Lake Zurich, through the dramatic alpine passes and gorges that lead to the country s southern regions. There is no external evidence of a trip south of the Alps into Italy. 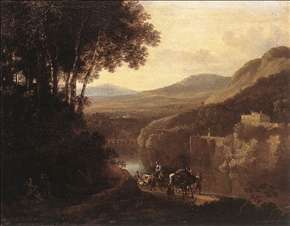 The light and motifs of his scenes of the Campagna, that comprise a large part of his production, suggest that he did. However, we know that he could provide a Swiss landscape with a blue Italian sky and flood it so successfully with southern golden light that it could pass as an Italianate scene; his exquisite panoramic view of The Lake of Zurich (Rijksmuseum, Amsterdam) was long wrongly identified as a representation of Lake Trasimeno in the Appenines. Hackaert also painted a number of wooden landscapes in Dutch settings with warm light dappling clearings, ponds, and roads lined with tall slender trees crowned with lacey foliage. These works often includes figures and animal, which are often the work of other artists, notably Berchem and Adriaen van de Velde. See more details about "River Scene"